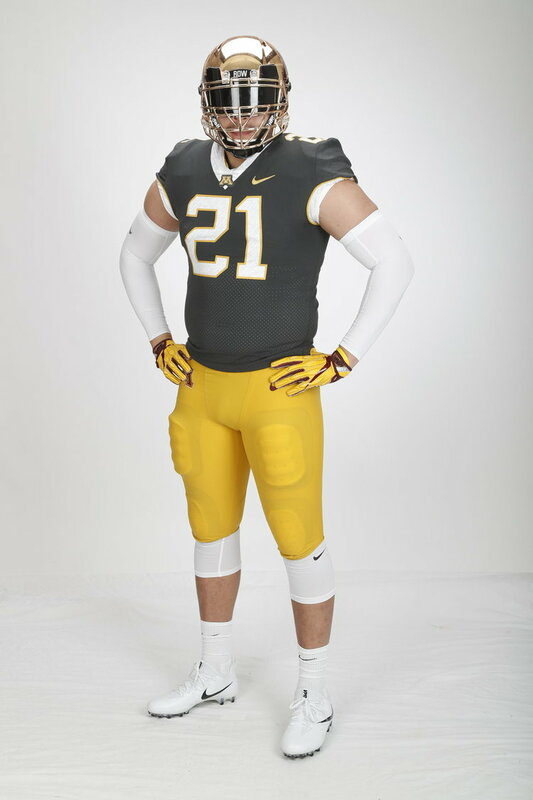 The Gophers have introduced their new look that is dubbed the H.Y.P.R.R. Elite uniforms. The words and inspiration for the new uniforms comes from Coach Fleck's mantra at Minnesota of "Embracing the past to create the future." Minnesota is taking Fleck's 'Row the Boat' slogan and merging it with Minnesota's own 'Ski-U-Mah' to create this bold new look. With the new ook the team now has over 100 new uniform combinations to take the field in. The new uniforms come with 3 new jerseys; Maroon, Anthracite, or White, 3 new helmets; Maroon, Gold, or White, and 4 new pants; Maroon, White, Gold, or Anthracite. The team's new Gold Chrome helmet is one of the nods to the past from when the team wore gold helmets but adds a new school twist with the chrome finish. On the jersey numbers and collars you will find a unique pattern of an oar, boat and compass. We will also see the oar as the center stripe on the helmets.